The Cane Corso Italiano is a highly intelligent, loyal and protective dog that is very versatile and trainable. It is even tempered, alert, and confident, making an excellent guard or watchdog. Cane Corso Mastiffs are not aggressive, but will defend their owners fiercely when necessary. They are nearly unstoppable in a fight due to their unusually high pain tolerance. The Cane Corso Italiano is a highly intelligent, loyal and protective dog that is very versatile and trainable. It is even tempered, alert, and confident, making an excellent guard or watchdog. Cane Corso Mastiffs are not aggressive, but will defend their owners fiercely when necessary. They are nearly unstoppable in a fight due to their unusually high pain tolerance. The Cane Corso Mastiff is loyal, docile, and affectionate toward its family, especially children. The Cane Corso Italiano should be socialized when young to minimize aggression with strangers and other dogs, but even with training Cane Corso Italianos are usually on edge around those they don’t know. You can find Cane Corso Italiano puppies priced from $250 USD to $8000 USD with one of our credible breeders. Browse through our breeder's listings and find your perfect puppy at the perfect price. 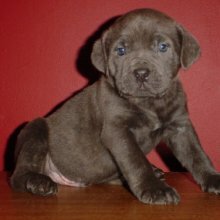 Cane Corso Italiano Puppies for Sale - Shipped Worldwide! Finding the right Cane Corso Italiano puppy can be dog gone hard work. PuppyFind® provides a convenient and efficient means of selecting and purchasing the perfect Cane Corso Italiano puppy (or Cane Corso Italiano puppies) from the comfort of your home, 24 hours a day, 7 days a week. Take advantage of our PuppySearch or leisurely browse our directory of hundreds of dog breeds, Cane Corso Italiano dog breeders, Cane Corso Italiano dogs for adoption, and Cane Corso Italiano puppy for sale listings with photos and detailed descriptions. Some Cane Corso Italiano puppies for sale may be shipped Worldwide and include crate and veterinarian checkup. Many Cane Corso Italiano dog breeders with puppies for sale also offer a health guarantee. With thousands of Cane Corso Italiano puppies for sale and hundreds of Cane Corso Italiano dog breeders, you're sure to find the perfect Cane Corso Italiano puppy.